No finishes this week – unless settling on a kitchen remodel design counts? – but I did make a new start. I’ve been sewing lots of little squares together in spare bits of time. There hasn’t been a lot of spare time, because spring means getting to the neglected yard work and we’re also been spending a lot of time looking at cabinets and countertops, but I have gotten some sewing done. The dining room table is lost beneath all the scraps and cutting boards and irons. For quite a while I’ve been cutting up leftover fabric after each project into whatever square sizes will fit. Five inch if possible, some 4 1/2″, and the rest become 2 1/2″. The littlest ones were really starting to pile up, although for once they were piling in neat little stacks instead of a mound. Some effort to be organized is going on, though my family would deny it. I found an online pattern called Growing Up Odd that uses up a multitude of squares – 2,425 of them in the original pattern! I separated out the lighter and brighter fabrics for the most part and stuck to the darker tones, but other than that it is very eclectic. There are batiks and 30s style little florals and the occasional giraffe. Everytime I pick up a square I remember the quilt or bag or basket that came before it, which is what I love about scrappy quilting. The original calls for 2″ squares, and mine are 2 1/2″, so I’ll be making fewer blocks or it would swamp any bed we have. I haven’t decided yet if I’m going to try for a king size, which would mean quilting it in pieces and then attaching them so I can handle it on my home machine, or if I’ll scale it down to the usual generously sized twin. We use those so much around the house, but I really need a king size quilt for the summer months when the down comforter is too hot. I’m just not sure this is the pattern I want for the bed – I have a picture of giant flying geese in my head for that one. On the other hand, I don’t have all the fabrics that I want for the geese, and we could probably stand to have more than one large quilt as an option. Not a decision I have to make at the moment, which is good because my head is stuffed with kitchen backsplash tile options with little room for anything else – why are there So Many Choices!? I can just keep mindlessly chain piecing little squares when I can’t look at tiles anymore. It is soothing. 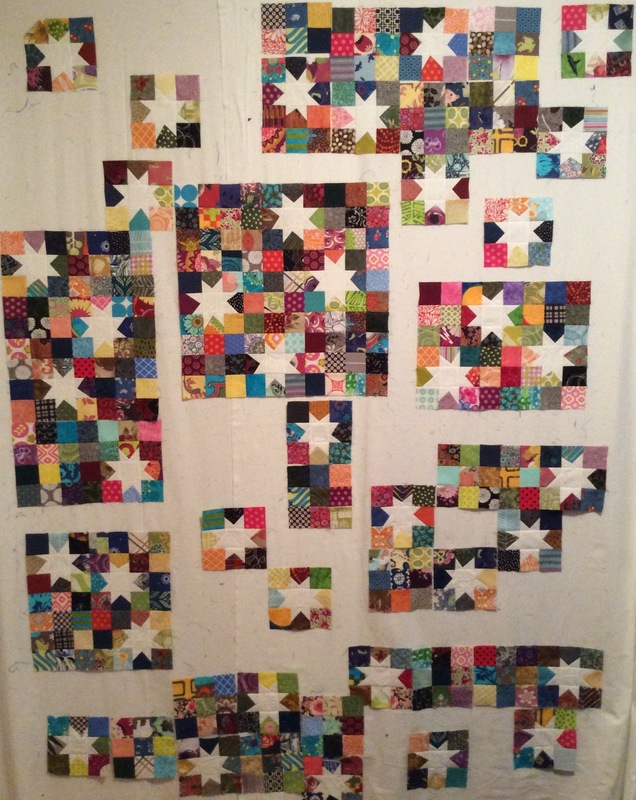 I have 50 9-patch squares done, and a lot more little 3-patches to join together. Chain piecing goes so quickly, but I’m going to need a lot more. I spent time today adding in squares to start attaching the stars. It is like doing a puzzle, but making the pieces as I go along. The pile of squares is diminishing, and I don’t want to repeat the same fabrics too often, so I’m going to need to dive back into the scraps to make more soon.